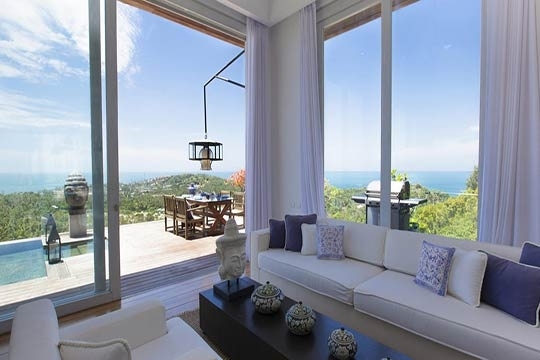 If a picture-perfect panorama is one of your must-have holiday ingredients, then Villa Belle’s uninterrupted views across Plai Laem and Choeng Mon bays to the neighbouring islands of Koh Phangan and Koh Som should put this villa high on your list. Boats come and go in the distance and temple roofs gleam brightly between the coconut groves stretched out below. 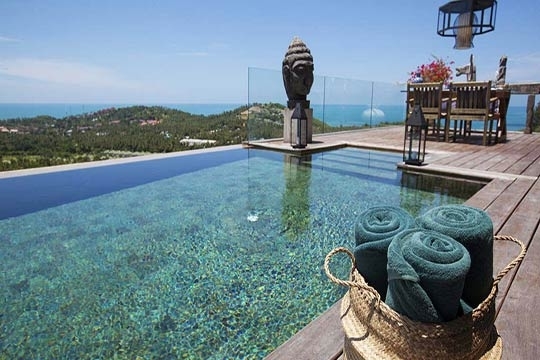 Peace and privacy seekers can also tick the boxes: Villa Belle’s hilltop position and natural forest surrounds mean that the only noises to be heard here are birdsong and insect calls – although with easy access to the happening nightlife and shopping hubs of Samui, the villa provides the best of all worlds. Villa Belle’s interiors are equally pleasing. Art-lovers will appreciate a fine collection of paintings, statuettes and artefacts, while functional pieces such as lights, occasional chairs and kitchenware are just as thoughtfully and tastefully selected. Vaulted ceilings and vast custom-made doors that seem to stretch up forever, coupled with white blinds and soft-flowing curtains, all add to a sense of space and airiness. 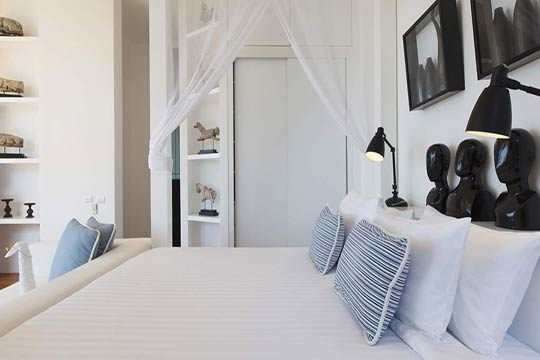 For friends travelling together Villa Belle makes an excellent fair-share option as all three spacious bedrooms have king-size beds, huge bathtubs and are equally stylish and well appointed. 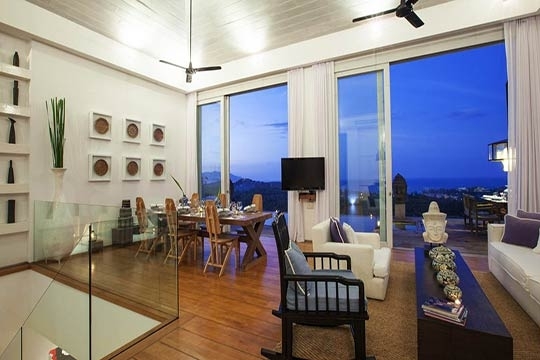 With both indoor and outdoor relaxation areas (the latter enhanced by splashes of cerise from the potted bougainvillea and strategically placed stone and wood statues), guests won’t feel on top of each other, yet the social areas are perfect for enjoying meals together or drinks around the pool to take in the views. A team of attentive but unobtrusive staff service the villa and provide a hearty continental breakfast. 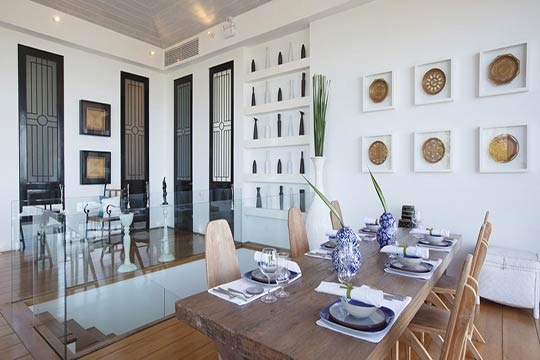 The well-equipped kitchen is ideal for self-catering and it’s an adventure to shop at one of the nearby local markets, while who will be able to resist a seafood barbecue or two out on the panoramic deck? Should you prefer a chef to come in and prepare your meals, Villa manager, Khun Noom, can arrange this for an extra charge. Alternatively, there are many excellent restaurants only a short drive away. 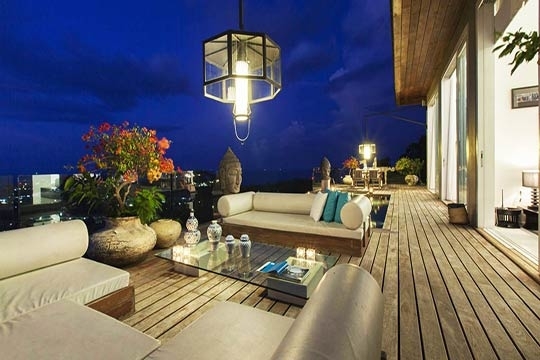 A stylish and breezy villa with spectacular views, minutes from the beach. 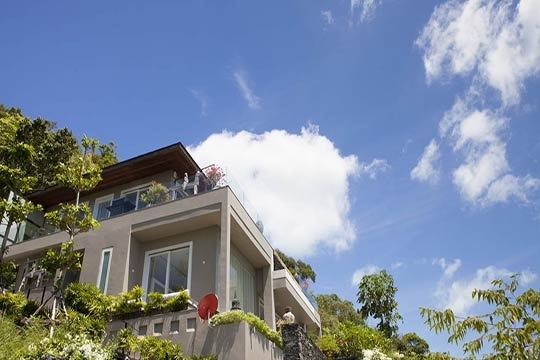 Villa Belle is located at the end of a steep but easy-to-access concrete road, offering views over coconut plantations across to the bay. There are no shops or restaurants up this road, but a few local street cafés and shops can be found before the turn off. The villa’s only near neighbour is Villa Michaela, lying just below. 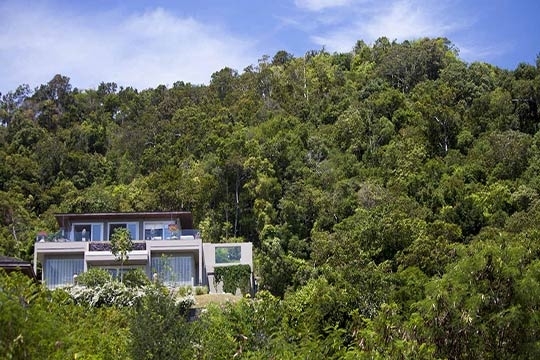 Forested areas on either side screen the villa and offer privacy. A kilometre away is popular Choeng Mon beach and other smaller bays are within a few minutes’ drive. Although Villa Belle is close to the airport, it’s not under the flight path so there’s very little aircraft noise. 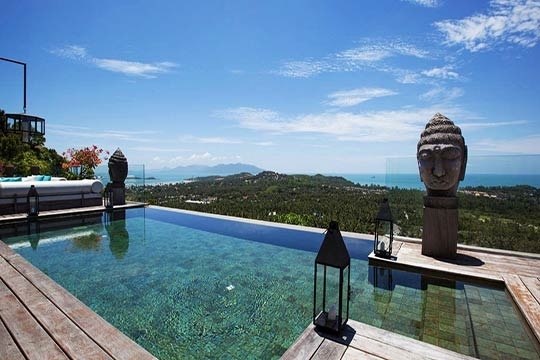 Plai Laem occupies the eastern side of Samui's north coast peninsular, which most visitors know thanks to the Big Buddha statue that sits proudly on a small island at its apex. Plai Laem is the less developed of the pensinsular's two coasts, although easy access to the airport and ferry piers to neighbouring islands has prompted a number of new villa developments, low-key resorts and small residential compounds to spring up, both along the seafront and scattered through the palm-clad hinterland. The restaurants in this area are mainly of the local variety, although some of the resorts also offer international cuisine. The beach is narrow for most of the year, so not really a bathers' paradise but the views across to the small island of Koh Som and left to the Big Buddha are superb.. For local culture, Plai Laem temple is an impressive, colourful compound containing large religious statues set in a man-made lake filled with carp. Stepping over a lily pond into Villa Belle’s lower-floor entranceway, eyes are drawn to the artwork and feature lighting. 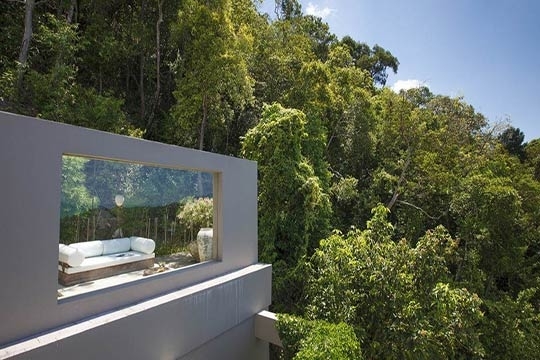 An alcove is furnished with a writing desk for those who need a holiday ‘office’, while tall black lacquered doors lead off left and right to the two guest bedrooms. These well-proportioned air-conditioned bedrooms both offer stunning views of the bay and boast large sunken terrazzo bathtubs set into the bedroom itself. 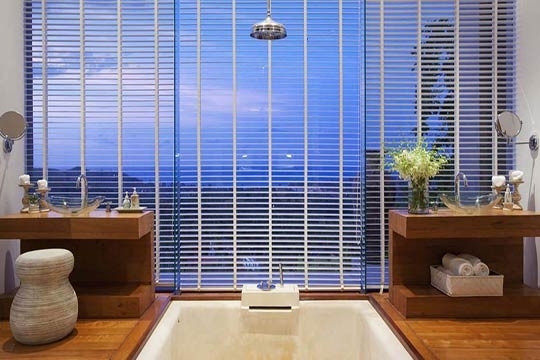 Rain showers are suspended above the tubs and his-and-her wooden vanities and glass basins are also a feature of these in-room ensuites. 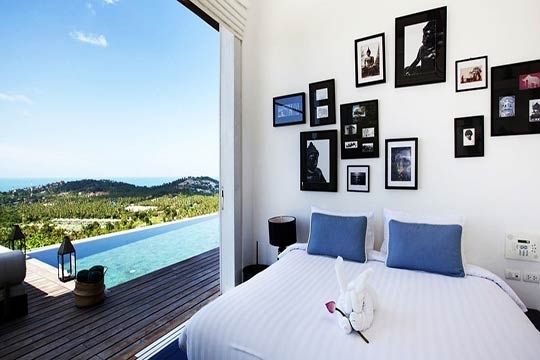 Four-poster king-size beds with pale blue scatter cushions form focal points, as do shelves lined with statues. The black-lacquered theme carries through to these bedrooms, with bell pendant lights, ornate TV cabinets and four-metre high doors. White blinds and beautiful wooden floors with sisal mats complete the calming look. 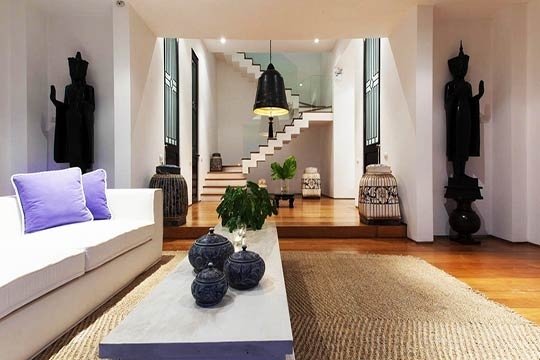 From the entrance hall an open staircase leads up to the living area and master bedroom. 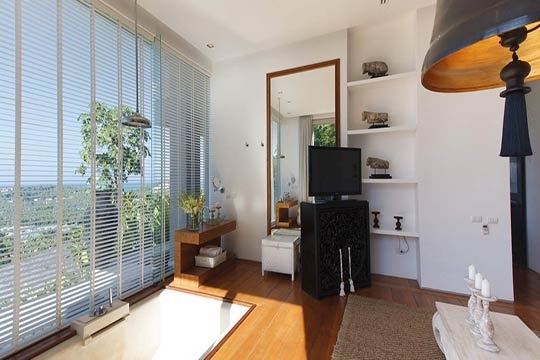 The master bedroom has similar features and facilities to the downstairs bedrooms, but here the over-sized bathtub is in a private garden, while sliding doors lead out to the pool deck. 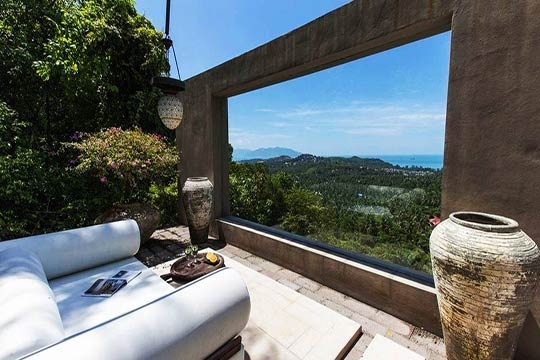 To the side of the bathtub is a secluded outdoor sitting area, complete with ornate Moroccan-style light and a framed glass partition highlighting the views. 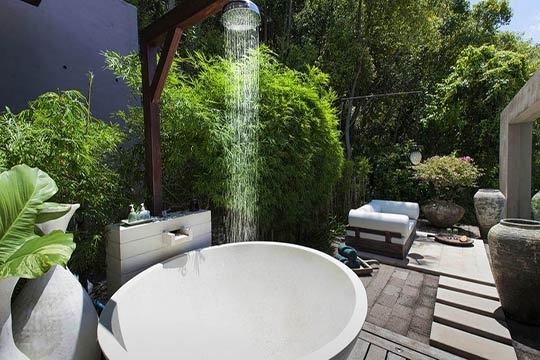 The master also has an indoor shower room. The living room, with its vaulted whitewashed ceiling, floor-to-ceiling doors, and wispy white curtains that softly flow with the breeze, melds seamlessly with the outdoors. To the rear, a glossy white kitchen with an island unit and ornate wooden bar chairs is open-plan to the antique wooden dining table (seats eight) and the comfortable white couch. 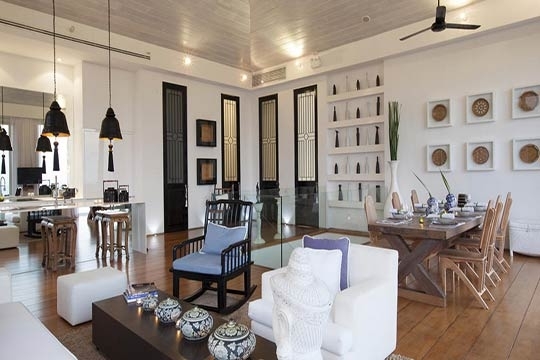 Wooden statues, feature lighting, paintings and fresh orchids add warmth and character. The outdoor living area forms an extension of the indoor space, with a wrap-around wooden deck accessed via the lounge or master bedroom. Glass balustrades ensure uninterrupted views and the outdoor seating area here is ideal for afternoons by the pool and evening cocktails. 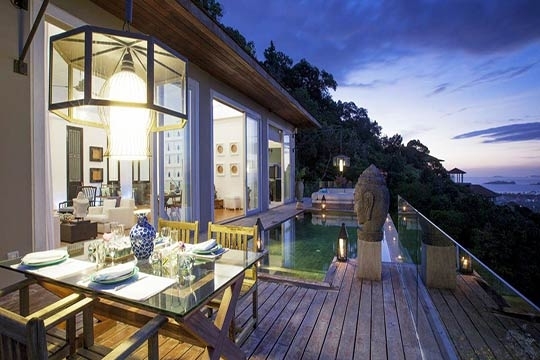 For alfresco dining, a six-seater dining table and barbecue flank the pool. 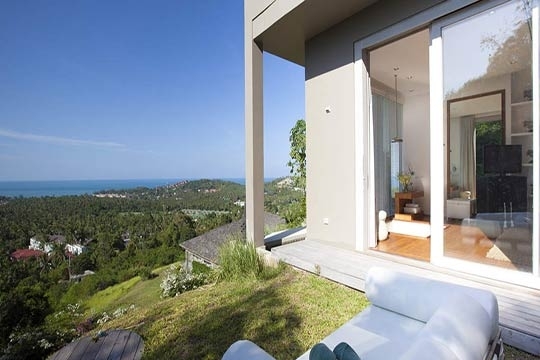 3 bedroom villa located in Plai Laem, Koh Samui. Ideal for Beach in ten, Body and soul, Going for golf, Fair share for groups, Romantic retreats, Room with a view.